It’s illusive. Hard to define, to harness the concept. Grace. A gift from God given to us freely with no strings attached. An assurance that we are being held whether we are aware of it or not. Worry and fear try to stop us, often successfully. Yet, grace remains. Quietly, steady and patiently waiting for us to notice. And merely to accept and fall into it. God is always next to us, in front of us, behind us, around us and especially within us. God’s presence is not dependent of our awareness. But when we are aware and enter it fully without question, our days are transformed, becoming new again and again. Grace has no explanation, logic or reasoning. It just is. Grace wakes us up, jolting us from our busy trance and worldly slumber to see a sunset for the first time. To find the hope in a hand held. To seize the utter joy hidden in simple moments. 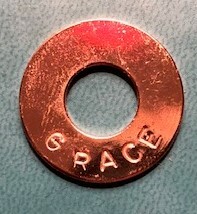 Grace is a free pass for being human. It is love without condition, the only real love that there is. Grace allows us space and time to move through dark days, confused and afraid and to savor deeply the arrival to the other side. It is patient, kind, a warm embrace that never let’s us go. We need not pray for grace for it is given independent of our control or worthiness. Pray for the awareness of the seeing grace that is already present right now, ready to heal and make us whole. And in the grateful awakening, we can dare to extend grace to others. Gently opening the door to peace, love, kindness, forgiveness, patience, empathy and awe. Wake up to grace in your life. And the only thing you have to do is accept it without question and enjoy the ride. Amazing grace. How sweet the sound. "Cast Light" is a call to release your inner light, your true self every day. Choose light and cast it to the world.